LONDON – July 13, 2016 – Mooreland Partners, the leading independent investment bank providing M&A and private capital advisory services to the global technology industry, today announced that it acted as the exclusive financial advisor to Nextperf on its sale to Rakuten Marketing. The acquisition of Nextperf further strengthens Mooreland Partners’ position as a leading global M&A advisor on transatlantic, strategic transactions in the Digital Media & Internet sector. “The application of artificial intelligence and machine learning is growing in digital marketing. This is Mooreland’s second transaction involving a company delivering solutions based on unique artificial intelligence expertise in 2016 following on from the recent sale of Expertmaker to eBay,” said Peter Globokar, Managing Director at Mooreland. Headquartered in Paris, Nextperf is a leading provider of retargeting solutions and artificial intelligence applied to online advertising. The company is active throughout Europe as well as in Brazil and North America, with a portfolio of nearly 1,000 clients for whom it guarantees the highest market ROI. Nextperf provides a scalable platform that allows marketing departments to manage their display budget with innovative models (skin retargeting, web to store, consumer advice within banners, video) alongside real-time analysis of user profiles, purchases and dynamic content creation. Headquartered in New York, Rakuten Marketing is the global leader in omnichannel marketing, delivering its vision of driving the omni experience – marketing designed for a streamlined customer experience. 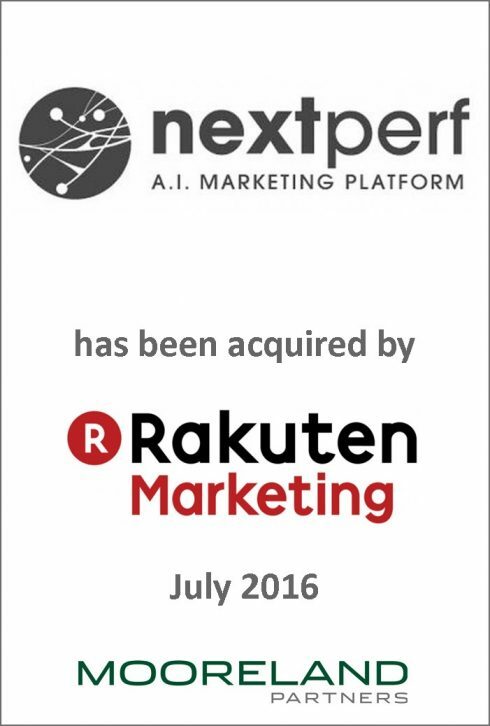 “Nextperf will complement the existing Rakuten Marketing display technology with enriched user scoring and ad intelligence and act as an anchor for expanding Rakuten Marketing’s presence in Europe leveraging the activation of data from across the Rakuten network,” added Seth Kundrot, Executive Director at Mooreland.